“Your opinions are heretical and opposed to the Holy Scriptures,” his interrogator admonished, “So you must dismiss them and never speak of them again!” Galileo was then placed under house arrest where he spent the remainder of his life for his belief that the earth was moving around the sun, and not motionless at the center of the universe. It was the year 1633 when the Church summoned the early astronomer to examine his theory of heliocentrism, and to judge it blasphemous against the formal teachings of the church. Today, no one questions Galileo’s belief, for we know he was correct. I am no scientist, and while the best I can offer astronomy is my casual bare-eyed gazes upward on a clear night, stories like these make me aware of the need for caution when dismissing those who are inclined to have a rather different view of cosmology in the creations than the one I’ve held to most my life. The church in the days of Galileo now looks pretty ridiculous in the eyes of us living centuries later, although it may be wrongly judgmental to feel that way, for they were merely defending the perceived truths of the day. Still, it gives us an opportunity to not fall prey to the same errors they did, and to prepare ourselves to communicate with those of different opinions instead of writing them off as beyond the pale. The poison, in an age of sensitive extra-biblical persuasion, may not be lending an ear to its message so much, but the refusal to explore it over a cup of tea. 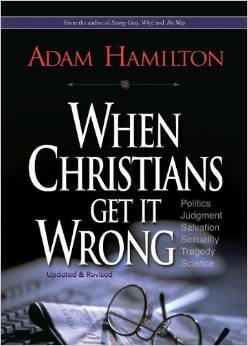 This entry was posted in Adam Hamilton, Books and tagged Adam Hamilton, Christianity, creation and evolution, Galileo, heliocentrism, inspiration, wrong christians. Bookmark the permalink. I am a scientist, I look at atoms for a living, but I am afraid to admit that among Christians. The moment most believers I do and teach science at college level I am automatically viewed as a man of weak faith. The loudest voice echoing from science among Christians is that of atheists. Hence the stigma around science among Christians. I believe science is a necessary prop for faith. Even God made Abraham employ the scientific process regarding His promise. Abraham had to appeal to astronomy. One thing I will agree on is the Bible is not a scientific journal, it does not need editors or peer reviewers. I must say that your response makes my writing these words all the more worthwhile my good friend. I agree; the Bible need be no science book. We need more scientists who are Christians to speak even louder; to show how the heavens declare His glory! Thank you for being willing to step forward into what you refer to as hostile grounds. I would love to have a cup of tea with you! I cannot tell you how many times I felt out of place, when science gets attacked from the pulpit. My first blog article on WordPress was my confession. Many times after being harassed and maligned on the pulpit, I would ask God why he gave me my brain. In one small group I led, I began using science to help understand Christian growth. I am not the first person to do that Paul used physiology to explain unity of believers. Peter and David, although were thousand years before Einstein used theory of relativity to explain being in the presence of God. As scientist when we with hold the beauty of science in biblical exposition we might be robbing our fellow believers. I look forward to reading your first article, and encourage you to continue using the gift of being able to communicate the glory of our God with a knowledge of the sciences. Agreed; it will be robbing our fellow believers to deprive them of the gifts God has given us. Blessings! Truth is God’s and the Church has not always represented God or the truth! That is a fantastic and far beyond merely real statement my good friend. ALL truth is God’s truth, and we petty humans have only scratched the surface of exactly what that means. Love your ability to speak volumes in a single sentence! I was involved in a study with a para church group that taught the Bible was a science book and bended their teachings to conform “science” to story. So much so that they taught the heart thinks (that is only one of the many science contortions). The bigger issue with making Scripture a scientific journal is that it would tie revelation to a particular group for only a particular time. Scientific thought is constantly developing. Realizing that faith transcends culture, and culture’s scientific knowledge, helps me focus on what The Lord is telling us about Himself. What is His story. He is bigger than our “science” will ever be, and outside of it. Wouldn’t we be limiting Him to tie Him to ANY science? That is said very well (Wouldn’t we be limiting Him to tie Him to ANY science?). And, of course, I am moved that you direct the attention of these few words back to the importance of seeing our Word from our Father given in story! Good, really good.